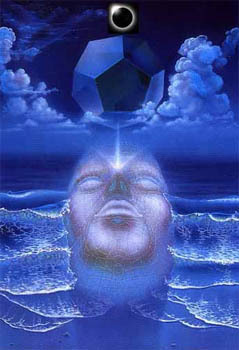 With infinite blessings to every dear soul reading our words, we are the Hathors of Earth’s Solar Astral Planes. We watch over you via the Logos energy that we send you. We send the energy to you with our own energetic handprints attached so to speak; we throw our own personal Love into the mix of Logos energy that manifests through your chakras. In this way a mark of our specific energy is left upon you, and if your higher self and the many components of soul essence that make up your higher self choose to accept the handprint, a steady relationship is formed between us and those higher aspects of yourselves. Very many of you on Earth have taken to our energetic handprint, and we are developing very close bonds with many of you as a result. For most, this bond still has yet to be identified on the surface. Nevertheless we work with the Higher Self of the souls whose higher components have approved of our energy, to the point where we consider ourselves part of the collective of guides that you all carry with you. There are main councils of souls that as a collective perform the help that we give to Earth, and we of course working on your Solar Astral planes of Earth are a part of said collective. What we do on a moment to moment basis has to be felt to be truly understood, as is such with the higher realms. What you perceive now and the higher realms will be like day and night, like complete opposites. Once ascending back to these realms, you will realize just how asleep and convinced of illusion you have been. We perform the job of helping you to ascend back to these realities with much happiness. You have been told that we came to this world and to your sun from the planet Venus, and this is correct. We who are helping you on Earth are a part of the higher astral realms of the planet Venus, though Venus is not the only planet to carry our type of being, so to speak. As many of you subconsciously remember, the moment that many of you chose to be in service to Earth by incarnating here, a mass call in this universe came out to be of help to those souls (of Earth) that have so dearly needed it. We are such souls who answered the call, though not in as direct of a way as you who are actually incarnate on the surface of Earth are. Many of you had the choice to perform the type of work we are doing, and you could have in fact inhabited our positions instead of the ones you are in now. But, as you have been told the souls that are incarnate on Earth right now which are all of you, are some of the toughest and noblest of souls throughout the universe. Earth is by no means an easy planet to be on, and as such those of you who answered the call to actually incarnate here are looked upon as very brave and noble as well as a bit foolhardy. You were in fact acting upon a slight distortion when choosing the option of incarnating on Earth, but this does not mean in any way that you shouldn’t have done so. To explain this further we should take a look at how some of you view the term ‘distortion’. According to many channeled texts that many on your world have found to be very reliable, a distortion can be defined as anything at all that does not match completely the energy of Mother/Father Source. We ourselves do in fact not yet match the energy of Mother/Father Source, but that does not mean that we are in any way ‘bad’. Rather, we are very Loving souls with the ultimate goal of helping Earth to ascend. Though we are not yet matching our own energies with the purity of Source, you could say we still know and feel a lot about existence, about this Creation we are Living in. Our very essence could be viewed as a distortion of pure Source energy, but that means nothing more than that our energies do not yet (fully) match Source. So indeed, even though you were acting on what is perceived to be a distortion, until matching one’s energies with Source one can be viewed as a ‘distortion’ anyway so acting on another perceived distortion would have no negative effects. The very energy of the term distortion does not mean the same thing, does not have the same negative connotations in these realms that some on your world may associate with such terms. You also knew that even if there were negative consequences to go through by acting on a distortion which there are not, the good you would be doing for this planet of fragile souls would far outweigh anything that could be considered problematic. Oh dear souls of Earth, the work you are doing for the Light and for the very souls who would shun you in a second for your beliefs, cannot be effectively described as to just how wonderful it is. You are all performing the Creator’s work, and by taking on such valiant and helpful roles you are acting on a very pure ‘distortion’ – the purity of which many of you had not yet acted on before coming to Earth. You have heard that with the Earth experience, your evolution will naturally be sped up as a result of the speeding up of your growth in these final end times. This will be true for many, but we must stress the fact that how ‘quickly’ one grows is not only based from a linear standpoint, but is based on the growth of the soul and how they are absorbing and learning lessons. After having this Earth experience however, it truly may be for some of you that you are able to ‘blaze through’ so to speak lessons in the higher realms. For some of you this may come about because you are destined to ascend back to the very high realms of Creation that many of you come from. Some have heard that those who came to Earth from a sixth density and above level of consciousness will automatically ascend back to such levels when the final uplifting ascension energies kick in on your world around the end of your year 2012. This is not necessarily true, rather you will experience a rapid growth as you easily learn the lessons in fourth, fifth and above dimensional levels that you had already mastered before. Of course, again as with everything else this depends on which level you were at before coming to Earth; the souls on Earth at this time are so diverse in number and you have all come from many different echelons of Creation, many different levels of consciousness. But, you will all experience the rapid growth accordingly, and it will transpire with the level of consciousness you previously inhabited. This is not a miracle that is our doing, rather when you ascend to fifth dimensional consciousness, you will naturally begin to remember everything and this remembrance will trigger the rapid growth as you flow so freely and easily through the lessons of the realms you had already mastered. We are happy and delighted to do our work in directing the Logos energy from the lower astral realms of the sun on through our realms and then to you all on Earth. Many different sources have been explaining the process of the movement of energy from Source to you on Earth, and we would like to do our parts to provide the ‘missing’ pieces of the puzzle. We would first like to say that once you begin to integrate even higher levels of Christ-encoded energy that is being sent to you, all that is being described to you that you may perceive to be difficult to understand with mind, will naturally be easier for you to understand and fathom because you will have expanded both mind and Heart significantly by such times. All will be seen as natural and harmonious, and really would you all have it any other way? We certainly wouldn’t, and we enjoy every last minute of directing the energies of Love and Light through the chakras of all of you who are integrating such energies masterfully. Besides the sending of the energy, we have also done much clearing work in the lower astral realms of your earth, those realms more ‘hellish’ than 3D that many of you have referred to as third and fourth density-negative. The clearing of lower astral planes is something that nearly all of you have been magnificently assisting in whist your bodies lay asleep. You are now performing this work so much more than we are and with such grace, that we have in fact surrendered most of the responsibility to do so, to you all for when you are in the sleep realms. The sleep realms are the astral realms of Earth as many of you are beginning to figure out, and once here, though your bodies lay sleeping your true soul essence is able to get much done. The majority on your world, even those awakened are Living in environments that have proven to be of a lower density, and you all are hard at work in your local astral areas transmuting the dark energies and embodying more and more Christed Love and Light to these astral planes, that had been lacking such energies for a very long time. Of course it is one of our enjoyed duties to help you all integrate such energies, and when things begin to pick up and you collectively reach a state where you will be able to perceive of us, we will go a long way in explaining the true healing effects of Light, sound and color which is the Light energy in an individually expressed form. These very basic foundations form and create your entire reality and in fact all of Creation, and while the Light has grown very dense and seemingly void on your world, when integrating such Logos energy of a much higher and more beautifully expressed nature it serves to heal and uplift the lower dimensional Logos. It then serves to upgrade (the lower dimensional Logos) as it makes its way through this lower energy. This is why many ascended sources continue to stress the importance of guided meditations with certain tones and frequencies, as these tones will serve to work with and transmute the lower ‘gunky’ energies that have built up in the chakras of so many. That lower energy is still Logos energy, just simply in a lower dimensional expression, and as such its very atoms will unite with the very atoms of the Higher Logos energy that is manifested through the sound waves and tones of healing. As mentioned above, this has a natural healing effect on the karmic residue built up around the chakras, and while the energy clears your chakras out to prepare to take in more and purer Logos energy that we are helping to send to you, it also hollows out your very body temples to create a new template of Light that is to fill your body and spirit complexes with the most beautifully expressed Love and Light that you have yet to experience. We Love you all so very much, and until our next communication we say remember to treat yourselves and those around you with much Love, Grace, compassion and understanding. What you send to others will now be sent back to you tenfold, and you have our word on this as we are helping to direct such karmic experiences your way. This entry was posted in Article, channelings, reblog and tagged 15 November, 2011, channeling, channelings, direction of source energy, Disclosure, Distortions, Earth, ET, Growth, Higher Realms, spiritual, Spiritual evolution, The Hathors, The Hathors of Earth's Solar Astral Planes, Wes Annac, World. Bookmark the permalink.